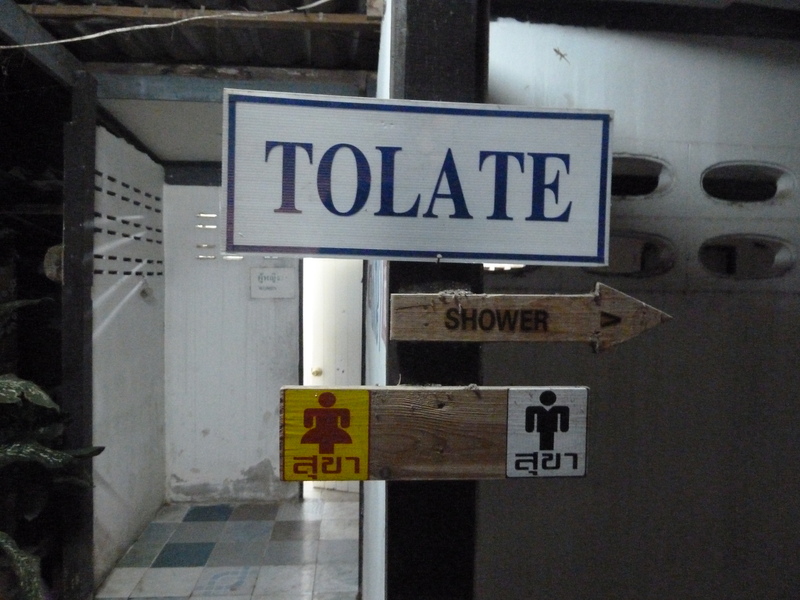 I’ve never slept rough before, but thanks to another wonderful Thai journey, all that has now changed. 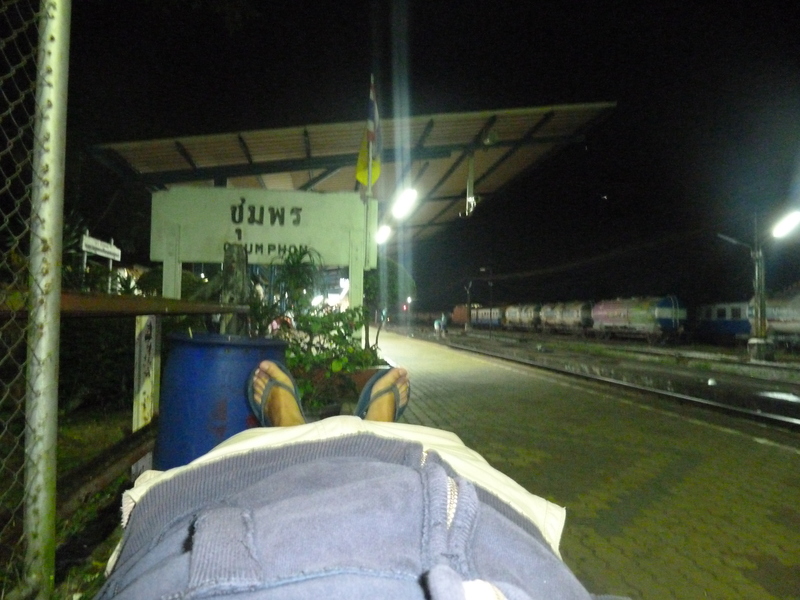 Welcome to Chumphon railway station on mainland Thailand, 4:03am, cold, full of mosquitos and altogether a pretty miserable place to be thanks to a seven hour wait for a sleeper train, which then turned out to be more than five hours late arriving. I’m on my way to Kanchanaburi, around two hours north of Bangkok. My time in Thailand is quickly running out – with just two full days left, I’d set myself a challenge that even Anneka Rice would be proud of. 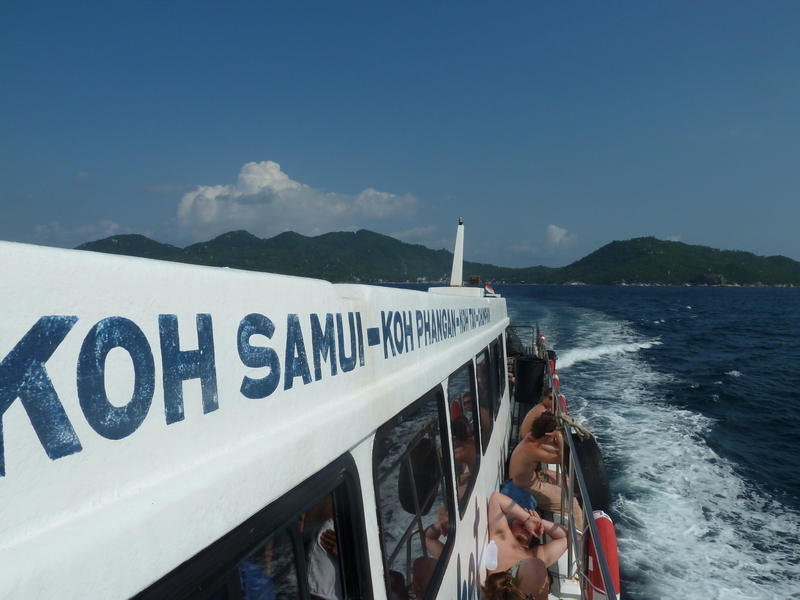 Having completed my diving course on Koh Tao, I decided to head back towards Bangkok in readiness for my flight out of paradise and over to Australia on Sunday. Today was Thursday, and between now and then I want to cram in a visit to the Bridge over the River Kwai, a tour around Kanchanaburi’s war memorials and museums, a visit to Hellfire Pass another two hours north from Kanchanaburi, take a ride on the death railway, have a night on the Khao San Road in Bangkok and get my iPhone fixed, which once again has decided it doesn’t want to work anymore. As you can see, the to-do list is enormous, and its all got to be done within the grand total of 76 hours before I’ll hopefully be sitting in a padded blue seat drinking a British Airways glass of red and looking down on a beautiful part of the world I’ve been lucky enough to call home for the past few months. Currently, I have a rock hard marble bench, an oversize hoodie and Thailand’s finest biting flies for company. How appealing an economy class seat in a jumbo jet is right now! 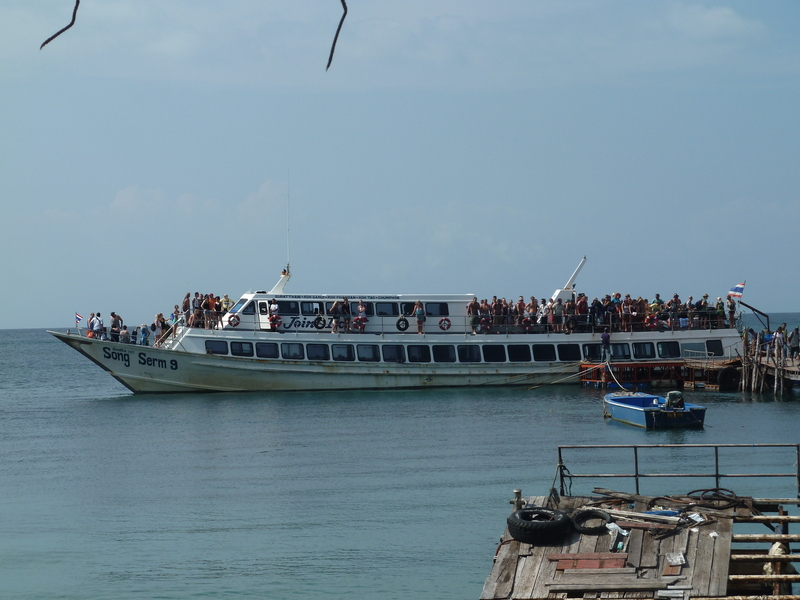 The challenge began with a 2pm taxi to Koh Tao’s pier for my three hour ferry crossing back to Chumphon on the mainland. All was going well at this point. 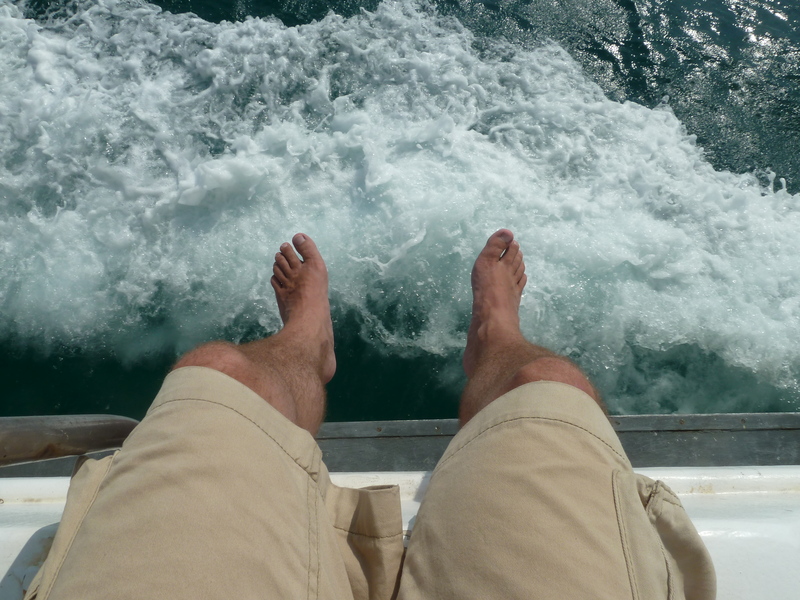 Infact, the journey across to the mainland was one of my most enjoyable trips across the seas that I’ve done so far – I bagged myself a spot on the upper deck, strapped my rucksack to the metal railing, slapped on some suncream and dangled my feet over the edge. 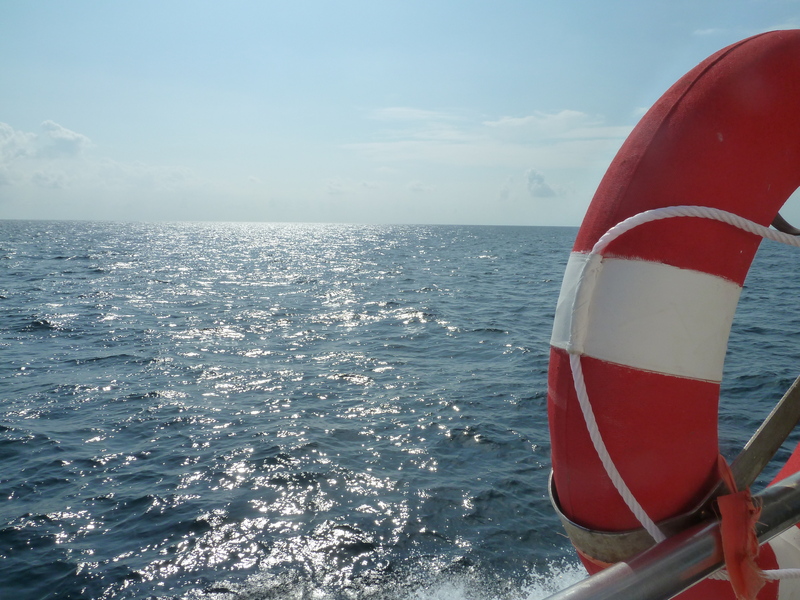 It was a beautiful late afternoon crossing, the sun glinting off the waves for as far as the eye could see. I sat for around an hour, looking out, watching as we passed fishing boats and dozens of flags marking the various fishing grounds. Every now and again, a flying fish would jump up through the surface, skittering along like a pebble being skimmed from a shore. I was lulled by the sound of the boat cutting through the waves, and the gentle rocking from side to side on the slight swell. I even had room to lay down for a short half hour nap, wedging my head on my rucksack as a pillow. It was one of those journeys that for some reason just seemed special. Maybe it was because it was the last sea crossing I’d be doing in Thailand for a while, maybe it was because I had the perfect spot to watch the sun start setting over the horizon. Maybe it was because I was on my own, unable to listen to music (iPhone problem again) unable to blog (I just knew the laptop would slip out of my hands and into the sea somehow) and instead alone with my thoughts, taking stock and remembering parts of my huge journey so far. 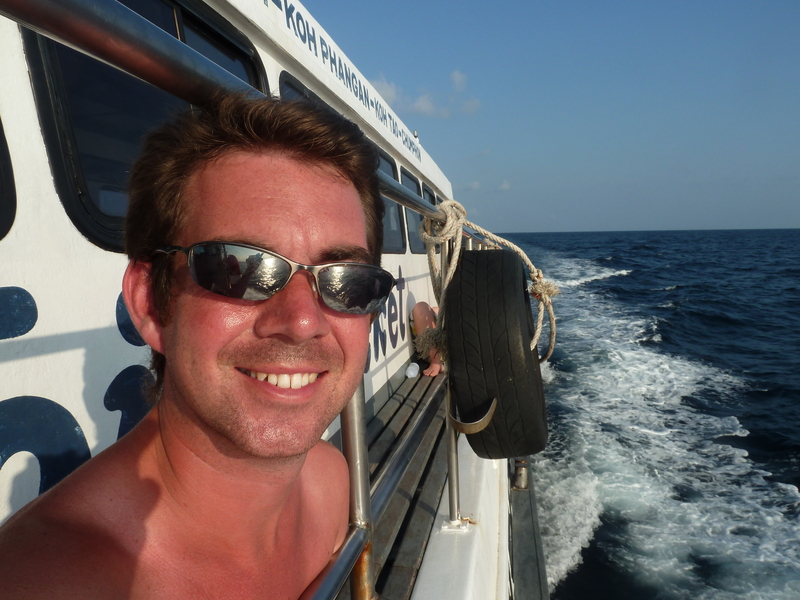 I can’t deny there was a huge part of me that was deeply sad to be leaving Thailand – its an incredible country, and I knew that every minute that passed was a minute closer to being on the plane and out of there. 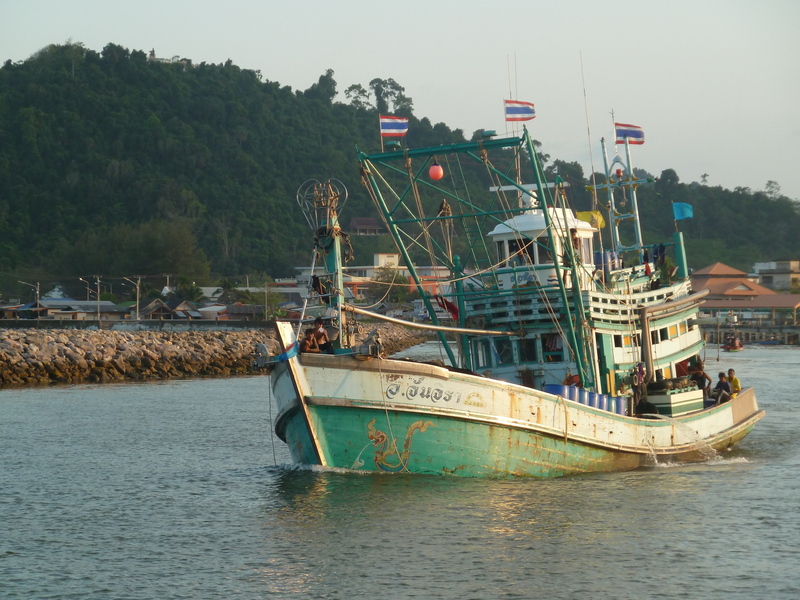 We arrived into Chumphon as a flotilla of fisherman and their trawlers made their way out of port and towards the fishing grounds for the night, many of them cheering and giving the boat full of slightly burnt tourists a wave as we passed. 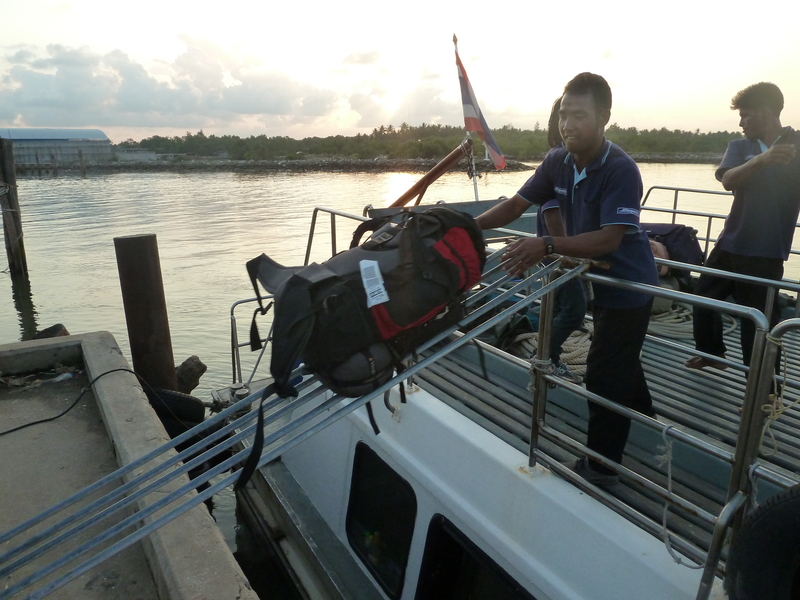 By now the sun was setting, and on dry land I was bundled into a truck and sent to the railway station. Definition of 'squeaky bum time'? Watching your entire belongings in a rucksack get thrown down metal pipes over the water. Thankfully mine here stayed dry! That’s when I met Mango. He’s a dog – a Koh Tao dog to be precise, and he was on his way to Germany. Thankfully he had a human in the form of Sheree from Berlin to guide him to the right departure gate at the airport, or, more likely, to the animal transport terminal. For little Mango was being rescued from a life of scratting around in bins, fighting other dogs for territory and generally taking his own life in his hands by suicidally falling asleep in the middle of roads like most other dogs on the island. 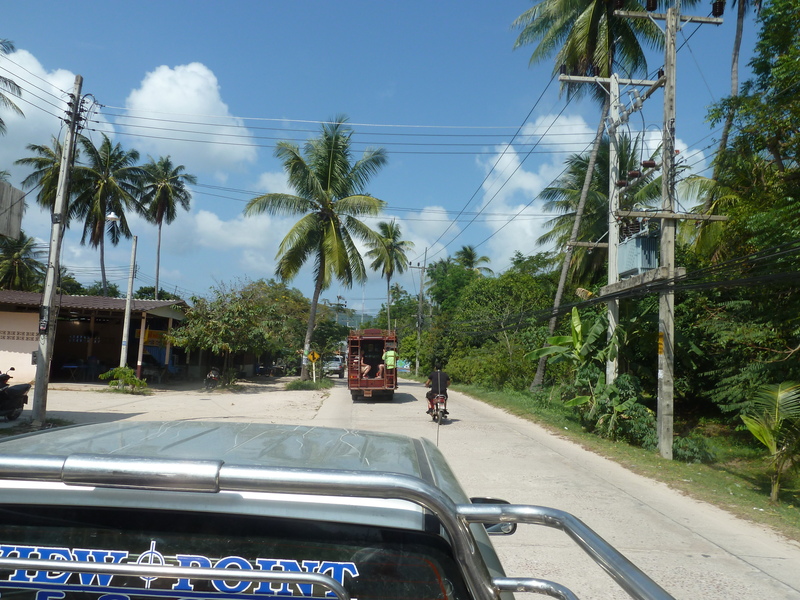 When I say ‘Koh Tao dog’, it’s a common term for the animals on the island, since most breeds are indistinguishable. Infact, you’ve never seen such a hotchpotch of interbred dogs than there are on the tiny island, apparently stemming back to when a couple of dogs were introduced a few years ago. Their population spiralled, their gene pool clearly developed problems, and now its becoming so overrun with dogs that there’s even a rescue centre to help deal with the problem. 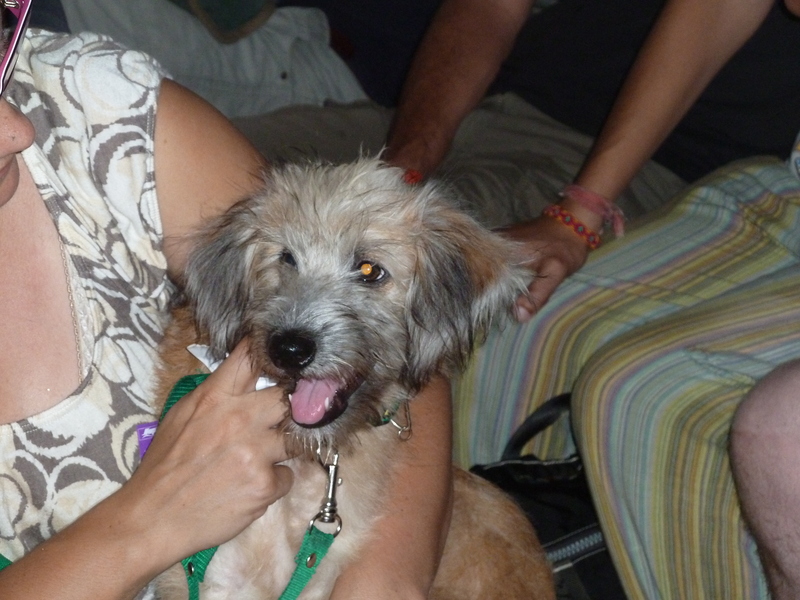 Mango, at just four months old, was being looked after when Sheree came across him and fell for him right away. It seems the feeling between the pair is mutual, almost as if the cute canine somehow knew he was destined for a better life thanks to the kindhearted woman who was to take him back to much cooler climes in Europe. It was the start of a long journey for him, but he didn’t seem to mind leaving his native home behind. Before I knew it, the bar was closing, I was being kicked out and the railway platform became my new home. I got talking to quite an annoying Aussie, who was far too full of himself for my liking. By 12:50am, my train was already five minutes late when there was announcement that one was arriving. “Here we go then, about time,” said the Aussie. “Well, its only five minutes late,” I said, at which point the rotund bloke sat back quizzically and asked me where I was going. “Nakhom Pathom, on the 12:45 Bangkok train,” I told him. “Good luck – this is the 11pm train and its only just arrived now, God only knows when yours will get here,” he shouted, throwing his blue diving kit bag over his shoulder and disappearing into a carriage. A station guard took a look at my ticket, and told me there was a two hour delay. Then a coffee maker told me it wasn’t arriving until 6am. Then the station master told me it was the next train. It was like the Ministry of Misinformation, and nobody could tell me a definitive answer. I kept myself amused on the free wifi yet again, Skyping the folks back home and even getting a little old lady who was selling dried squid to come over and give my dad and brother a wave, whilst simultaneously wafting her stinking stock under my nose. Then a train arrived. It was about two hours after I should have got mine, so I figured the first prediction by the station guard must have been right. I went to my carriage – it was locked. Some people who lived by the track saw me struggling with my bags and banged on the train for me, waking passengers and a train guard who had particularly impressive bed head. I climbed onboard and went to my bed. There was someone in it. The train guard, complete with his sticky-up hair, grabbed my ticket. “Wrong train – next one,” he said, shaking his head, bed hair going slightly limp. Oops! Actually, it wasn’t the next one…or the one after that. Or even the one after that. It was predicted to arrive at 5.30am. There was now nothing else I could do – instead of being rocked to sleep on a train, it was time to bed down on a bum and back-numbing solid stone bench, bag straps wrapped around limbs, hoodie firmly pulled over my head and mounting a losing battle against the swarms of mosquitos being attracted by the floodlight slap-bang above me. To add insult to injury, my Deet ran out after three squirts. Brilliant. Eventually the train arrived and I passed out in an already warm bed thanks to the passenger who’d just got off. I was past caring. The whole Thai train fiasco meant I’d missed my connection in Nakhom Pathon, which was supposed to get me into historic Kanchanaburi for a full day of sightseeing at about 11am. 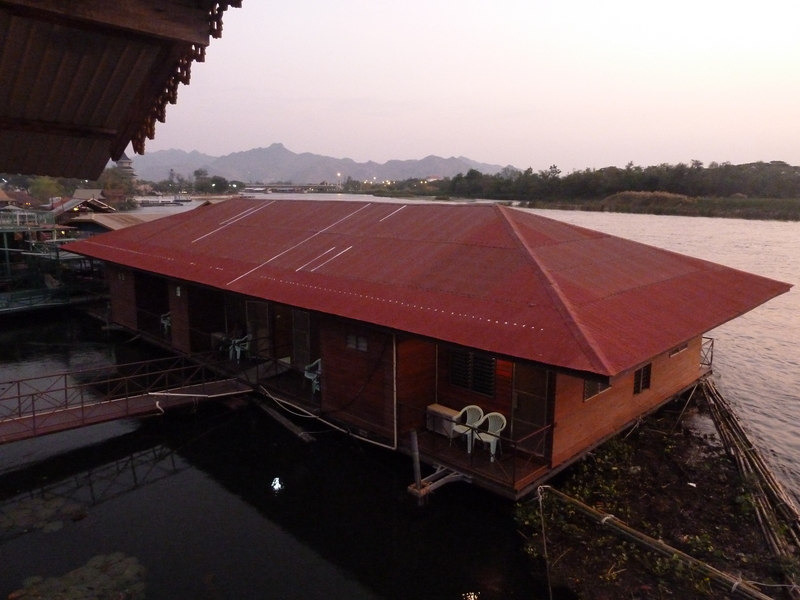 Instead, after a stunning piece of navigation around an alien city, I eventually found a public bus that got me there for 3pm, and after a quick ride with a cyclo rider, found a room for the night that actually floats on the river Kwai. Somehow, after a 25 hour journey, I had to fit all the sights in Kanchanaburi into just two hours. There was only one thing for it. I hired a motorbike. Well, the wounds have healed nicely from my little fall last month. The challenge is on!